Yes, these two kids are dressed in real clothes. (Size 18 month clothes which you can pick up inexpensively at garage sales.) Simple to build. Very clever design features knees that swing and thighs that pivot so you can cross the legs. Toddler clothes add realism and cuteness. Only the head and hands need to be painted. 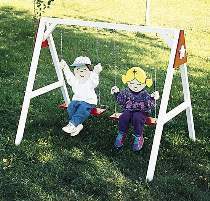 Plan includes FULL SIZE pattern for boy and girl, as well as plans to make the 40"H swing set.